«Pixelpopulation» is a series of posters designed for the public space of European cities. Digitally drafted, pixel-style characters populate urban space, thus creating a parallel digital world on walls, dustbins, traffic lights or large-scale billboards. The idea emerged from using pixel design and working in public space. The first wave of civilisation came along with rocket birds and clouds populating the air in 2003 soon followed by astronautic rabbits, flying robots or bats. 2004 started the colonization on the ground. The most widespread form was “X”, the small pixel alien, with “mister mic” and the “working class hero” at its feet. “Tagger”, “Mr. Officer”, “1-Bit Toy” and other characters complement the pixel population. "pixelpopulation" as a project was presented at cynetart_humane 2006 for the first time. Straight after this presentation "pixel-population V.2.0" started. The aim of V.2.0 is an complete population consisting of characters of all social classes. 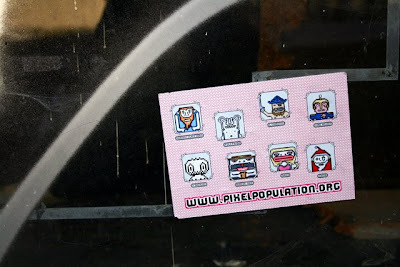 The population is spread by friends of the pixelnation in form of placards in urban space. www.pixelpopulation.org informs on news and growing of the pixelcrowd. On this website you can download printfiles of the pixelcrowd ( click on people ! ) for colonize the area near you. Send us Fotos of your recent pixelnation spreadings to foto(at)pixelpopualtion.org - please not bigger then 1mb. We will publish your works on this site.